Every 3 months I need to be reviewed by my oncologist. So every three months I go through enormous stress. Happily I have just got through today’s appointment so I can relax now for the next 2.5 months until the stress begins to build again. Gosh, these are just awful. 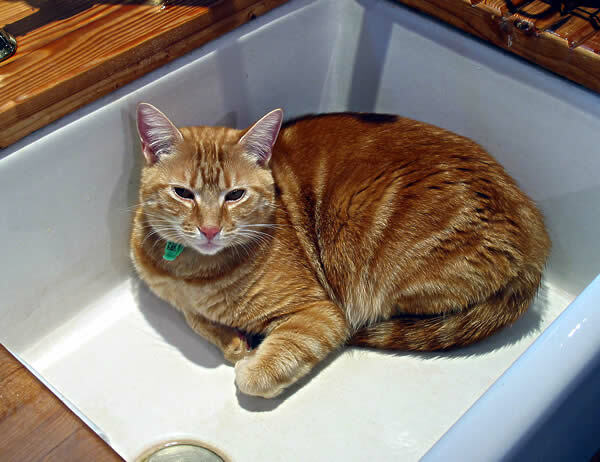 Here is a photo of Claude the cat happily soaking up the warmth of the last big porcelain sink I had – they stay warm for about 3 hours after you’ve had hot water in them and the cats love it. Claude is not a little cat! I actually asked the oncologist to chip in half but she refused, saying she’d just got the quote to re-carpet her house. Who needs carpet, I ask??? Yesterday Lenka came around with the quotes, and as I was trying to absorb them the doorbell rang. It was two little old ladies selling God. I told them I didn’t have enough money left to buy God, wished them a nice day, and closed the door. LOVE the picture of Claude! Having cats myself I knew that cats have that magical ability to find anywhere that is remotely warmer than their immediate vicinity and become instantly comfortable. It’s completely uncanny and completely cat like. I am however surprised to see one sleeping in a sink, normally mine are in there drinking any water that has pooled in the bottom because they are convinced it is better than the water in their numerous bowls. Claude is going to love the new sink Sara, that’s if you don;t sell him LOL. I’m please thst another 3 months have passed & you have received another all clear. Whoo Hoo. It isn’t really ‘all clear’. It is a just wait and see. I’m not being tested for cancer right now so no one actually knows what is happening, only that nothing outrageous (that physically affects me) is happening right now. It is going to come back, we just don’t know when. How do you know it is for sure going to come back? Can it not be in remission? Ovarian cancer almost invariably comes back. It is a highly aggressive cancer and there is no treatment that kills it completely. Remission is only remission, it is *not* ‘cure’. It might be a year, it might be 10 years. No one knows. But will it kill me eventually? Yes, it will. I am the one who has to face the reality, but invariably 99% of the people I meet instantly evolve straight into the fantasy land of ‘all cured’ even though I myself have never ever said that. It does me no favours and makes me feel as if people simply don’t see me. They just see some non-existent fantasy which makes it more comfortable for them, but does nothing for me, apart from leave me out in the cold. Invariably cancer sufferers have to deal with harsh reality themselves while most everyone else trips off into make-believe land (because it is more comfy for them that way). I can count on the fingers of one hand the number of people who do me the incredible gift of not doing this to me. Yes maam thank you for enlightening me. I have to admit I’m guilty of thinking that remission is equal to cure. I know mentally it must be difficult to come to terms with having any sort of cancer. My grandfather has colon cancer and if only he would’ve gone for his check ups then maybe they could’ve caught it early. I apologize if i offended you. I wish i were in to gardening, but I have to admit I really love your stories. Two of our cats love curling up in the dryer and were very disappointed after we moved since they now can’t get to the dryer to sleep inside it. Claude is very cute. All he needs is a rug and then you’d never get him out. I’m not a gardener, but i do appreciate the out doors, the sun, and wild life. I really do like the Blue Butterfly also known as Morpho menelaus. I’m sure you’ve hear the story (and now a movie) about a boy, with a terminal cancer, getting his wish from the Wish Foundation. He spent some months in the rain forest to find this Blue Butterfly, he came back out healthy. The reason for this was the rich content of oxygen he was breathing in every day spent there. There’s been a lot of death in my family due to cancers, bone cancers, breast cancers and ovarian cancers. I understand quite a bit about how it is to live with a loved one that has cancer. I myself came close to having cancer as i had pre-cancerous cells developing in my uterus some years back. It was the worst two years of my life. I’m glad to say that I am healthy now. What i am saying is that i understand what you must be going through. I’m not saying that oxygen can cure anything, but it is known that most bacterias, virus ext. don’t do well when exposed to oxygen. I’m convinced that it couldn’t hurt you or anyone with cancer to speak to a doctor about getting oxygen therapy along with everything else you must be taking. It’s harmless (while taken responsibly ), it’s healthy and I’m reasonably sure it’ll give you more much needed energy amongst other things. This website http://www.pureoxygenbarspa.ca/index.php is a spa in Nanaimo BC, Canada that offers an oxygen bar service, i know your not in that area however there is some information about Oxygen therapy within this site that i am sure you’d benefit from, even if there isn’t an oxygen bar near you, the tanks, mask and the refills for oxygen aren’t that expensive and you could have all this at home.